Installing supports in your bathroom can improve accessibility and empower people with limited mobility in their daily life. Toilet safety frames are simple, sturdy supports that will fit most toilets. 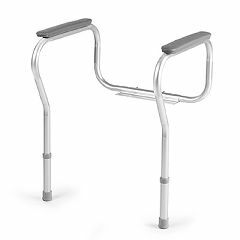 Allegro Medical offers a variety of options; many have adjustable heights and sure-grips on the toilet safety frame bars that allow for easier transitions between standing and sitting. Whether you are elderly, recovering from surgery, or living with limited mobility for other reasons, a safety toilet frame can provide the support you need to more easily use the restroom.